The Smoby Tefal Studio Kitchen intertwines creativity stimulation with life like sound effects. Featuring an electric with ceramic hob and extractor hood complete and soda machine, both with realistic sounds as well as an oven, refrigerator, sink with tap an espresso machine. The kitchen has been designed so little ones can turn around and move about whilst roleplaying cooking and baking. Includes twenty-seven (27) accessories such as pans, utensils, cutlery, crockery and meat play food, raw one side fried the other plus ample storage space. 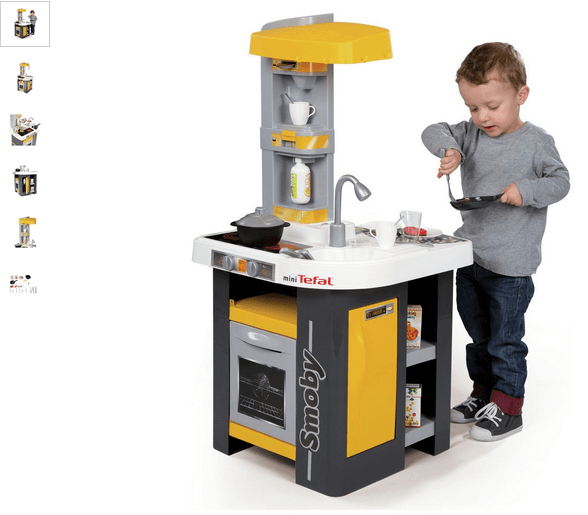 Get money off with April 2019 free Argos voucher codes, see if there's a promo code for the Smoby Tefal Studio Kitchen product. Argos may be out of stock of this product. To enhance your shopping experience you may also be redirected to a search results page when you click an outbound link. 5.0/5 from 3 recent reviews.